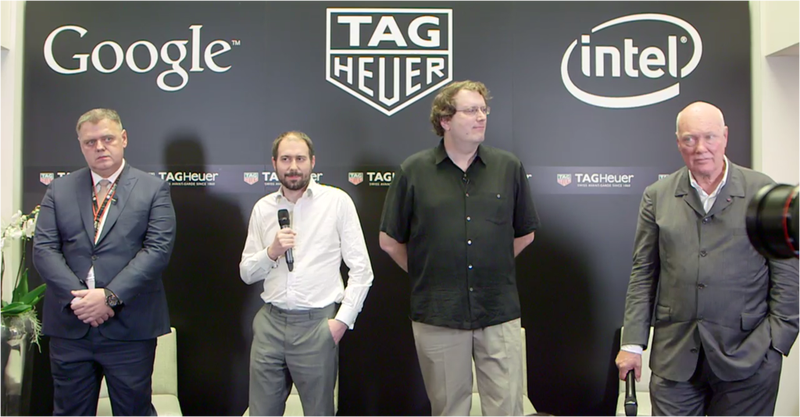 Swiss watchmaker TAG Heuer is teaming up with both Google and Intel are going to team up to make a luxury Android Wear watch to do battle with the upcoming (and expensive) Apple Watch. Sounds interesting! But unfortunately that's about all we've got in the way of details so far. Rumors have been swirling, and now they're confirmed. In an announcement that seems roughly one million percent an attempt to respond to the Apple Watch as quickly as possible, the Swiss watchmaker, along with representatives from Google, and Intel announced that, yes, the first luxury Android Wear smartwatch is coming, but basically no other info. Price, features, even what the dang thing looks like won't be revealed until later this year. If nothing else, the partnership shows that it's not just smartwatch makers that are afraid of the Apple Watch; it's the Swiss too. The folks at Tag Heuer are actually going so far as to lobby to expand the definition of "Swiss-made" to allow for the inclusion of microprocessors made outside of the country. How exactly this watch will look, work, and most importantly how it will compare to the Apple Watch is still pretty much completely up for grabs, but it will be assembled in Switzerland and sounds like it'll feature at least some traditional mechanical parts. We'll see! If you're looking to drop an obscene amount of money on a luxury watch with smarts, Apple won't be your only choice.